In Under a Christmas Spell, Lord Valiant Oakenhurst and Lucie Beaulieu were sent to charm and awaken two mere mortals to the delights of love. In this companion novel, we now see the fruits of their labors. At home on his estate, he simply wants to shut himself away forever. His aunt, however has other plans, and opens the manor to a group of marriageable young women for the Christmas holidays. The presence of an incubus and a succubus has already set the household awry. To Garrick, all are unwelcomed guests except one: Theodora Southern, his childhood friend, who’s no more wanting to marry than he . . . or does she? While Garrick is dodging the young women chasing him, Dora watches enviously from the sidelines. She’s sympathetic to the fact that her friend Lucie seems to have fallen (again) for Val, but she’s more than dismayed to discover she may have feelings for Garrick that are definitely not those of a friend. And Garrick? Is it possible he may be experiencing those same feelings? Perhaps the Christmas spell woven by Val and Lucie hasn’t backfired after all, but has simply spread slowly into the New Year, encompassing both cupids and their targets. 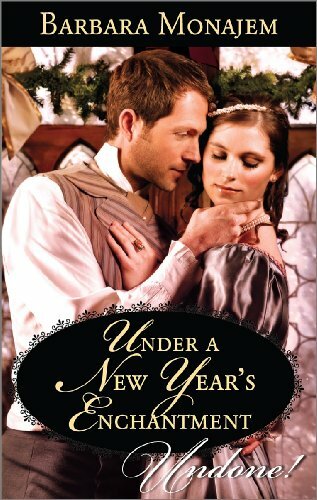 Under a New Year’s Enchantment is a nice rendering of the “rest of the story,” neatly tying up the tale begun in Under a Christmas Spell. Detailed explanations of English Christmas customs add to the holiday atmosphere and the usually witty dialogue one comes to expect from a regency romance make this an enjoyable read about a season of love in which two people come to recognize in each other the person each has been waiting for.